You must be a member of the London Cinema Group to attend this activity. Would you like to join this group? 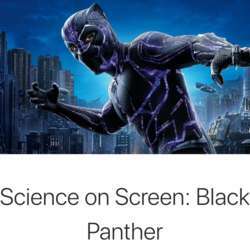 Francis Crick Institute presents Science on Screen, a series of compelling dramas with a science twist. Come along to enjoy a great film, complimentary popcorn, and explore the themes featured in the film with speakers from the Crick and beyond. This screening will be free but tickets must be booked in advance via Eventbrite. After the death of his father, T'Challa returns home to the African nation of Wakanda to take his rightful place as king. When a powerful enemy suddenly reappears, T'Challa's mettle as king – and as Black Panther – gets tested when he's drawn into a conflict that puts the fate of Wakanda and the entire world at risk. Faced with treachery and danger, the young king must rally his allies and release the full power of Black Panther to defeat his foes and secure the safety of his people. Followed by a panel discussion and audience Q&A to explore the themes of the film. 1. DO NOT TURN UP WITHOUT BOOKING TICKET IN ADVANCE – IS FREE! *If you wish to attend, please get your FREE ticket and ONLY then register. This invite is automatically sent to all members. If it is not your kind of event/film this time, then maybe next time. Going to the cinema on your own? - Maybe others want to see the same film, so please create a one-off activity to place your own films if you want people to join you.